Spatial's integrated repair and healing solution leverages decades of 3D modelling expertise to deliver unparalleled healing capabilities across a variety of modelling environments, for any file type. Are your organization’s files damaged by imperfect interoperability? Spatial's model repair and file healing capabilities allow you to heal your files easily and quickly without compromising quality or design intent. Restoring your files to their undamaged condition without loss of design intent is an extremely important aspect of completing your project correctly and on time. We’ve carefully crafted our 3D model repair software solution to remove these sources of tedium and difficulty from your operations. Other 3D modelling software development toolkits can often leave you searching for complementary repair and healing tools, which may pose compatibility challenges with your original software suite. Finding a match that doesn’t cause other issues is a frustrating experience. That’s why we’ve created our varying 3D software development toolkits to incorporate extensive repair and healing capabilities. 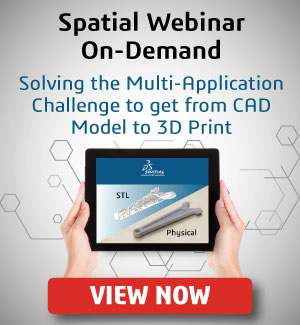 From 3D InterOp translation through to CGM Polyhedra mesh healing abilities, Spatial's solutions let you handle your development efficiently, in all areas, without any loss of quality or design intent. Don’t rely on tedious tools that take hours to restore files that fail to do so with complete accuracy. We’ve purposefully designed our integrated 3D file repair solution to be simple to use and work quickly, so you can get back to development and iteration without delay. With other solutions, you need to compromise on some level - either you lose design intent, quality is compromised, or some combination of the two. With our 3D model repair capabilities, you preserve the highest degree of quality while restoring the file to its original state. When you transpose your files from one program into another, geometric errors can be created. This renders the file unusable and costly, requiring time-intensive repairs. Our 3D file repair solutions have been carefully created to remove insanities and restore the file to its original condition with the design intent preserved as much as possible. We leverage our industry-leading expertise to deliver powerful solutions that empower your business to succeed at iteration and implementation of new systems. Our 3D file repair solutions have been carefully designed to meet your needs. Contact us to begin with a tool that removes difficulty and complexity from the file healing process.